If you haven’t been shopping for a home gutter system in a while, you’re in for a surprise. You may be thinking of gutters as a necessary investment in order to divert rainwater away from your walls and foundation where it can damage your home. And, of course, that’s the primary function of a gutter system, but the seamless steel gutters available from ABC Seamless Siding & Windows provide valuable aesthetic benefits as well. The designer-style, seamless steel gutters we install on homes in Springfield and surrounding Missouri communities are designed to blend into the soffit and fascia around your roof’s edge so that they actually become an architectural element that adds style to your home. We offer a selection of nearly 30 popular colors to choose from. Plus, the fact that we will custom-form your gutter system so that the troughs stretch from one corner of your roof to the other without unsightly seams is another way that our seamless steel gutters will add curb appeal to your home. The benefits of an ABC Seamless steel gutter system don’t stop at looks, however. Our gutters are made from heavy-duty galvanized steel that’s tough enough to take a beating from hail and windblown debris. What’s more, we bolster their strength by mounting them with our proprietary ultra-sturdy steel hangers, which keep them in place even under the heavy piles of snow and ice that can form along your roof’s edge. Plus, our gutters and downspouts are oversized to handle the heavy downpours that often occur in this area. Additionally, if you don’t want to worry about cleaning your gutters, we offer an exceptional gutter guard system, which is as tough as our seamless steel gutters and able to prevent even tiny debris from infiltrating your system. 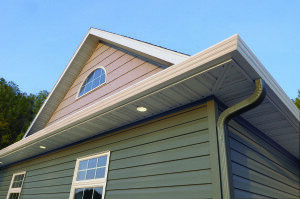 It’s also available in a variety of colors so you can match it to your gutters, siding, and trim if desired. To learn more about our seamless steel gutters and gutter guards, contact ABC Seamless Siding & Windows today. We proudly serve homeowners throughout the Springfield area.